Indian artisans are known for their craftsmanship and fine art and within India Rajasthan is the state which ranks very high in terms of arts and crafts. There are artisans in Rajasthan whose art is adored by people worldwide.We at kraftdeal have taken it as our mission to bring to you all such artisans who are being loved, admired and adored by the world at large but who have not been able to come up to the web world due to their limited capabilities. In this series, we are presenting to you the finest Hand paintings in Rajasthani and Mughal art by reknowned painters and artisans.The painting in this listing is a creative miniature art on a silk fabric and each piece is unique alias One of a Kind. 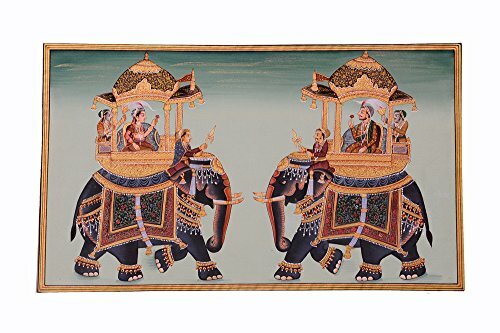 Mughal Miniature Painting - Striking Ambabari Elephant Art:This pair of Mughal Miniature Paintings (known as ambabari elephant art of Jaipur, India) was handmade using stonecolor on pure silk paper.With a flower in their hands, they each ride a richly adorned elephant towards each other. The abundance of decorative elements tells a story... they are royalty from Mughal, India. Their eyes tell an even more important tale... they are in love. A beautiful Ambabari Artwork piece for your home decor, indeed! Buy it today. Fabric painting on silk cloth is regarded as one of the toughest art form but with the kind of experience our beloved painters posses, they bring life to the paintings they make and when these paintings get place in your home or office wall, it gets its real place it admirer's heart and also gains a lot of kudos from people who look at it. We deliver it to you through Fedex in 3-4 business days after receiving clear payment in our account and that too absolutely FREE SHIPPING WORLDWIDE as our policy. So own it and be a proud owner of exclusive Rajasthani Fabric painting art. If you have any questions about this product by Handmade, contact us by completing and submitting the form below. If you are looking for a specif part number, please include it with your message.